I’ve found often times that we look to someone else to make these big decisions for us. We take quizzes in magazines, find checklists online, or watch movies; all to make sure that guy we’re dating really is “the one.” The world tries to tell us what the “perfect man” really is and that the relationship is doomed if every box isn’t checked. Ultimately, I feel like it’s not really about finding your soulmate, but finding someone who fits into your life and compliments you and your life in a way that nobody else would. Intentional choices: Make choices that you know will help the relationship and not destroy it. Commitment: You have to commit yourself to this person and not run away at any sign of trouble. Sacrifice: Not everything is about you all the time and sometimes you need to give up what you want for what they want. 1Meha, Nivanya. 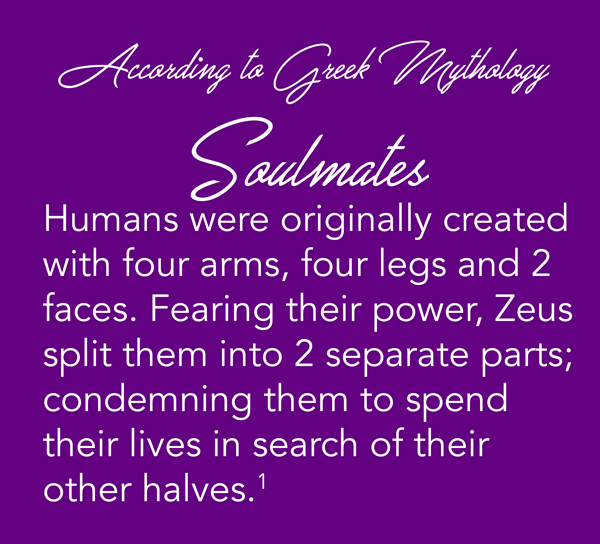 "What Is the Theory of Soul Mates According to Greek Mythology?" www.quora.com. Last modified 2014. Accessed 2018. https://www.quora.com/What-is-the-theory-of-soul-mates-according-to-Greek-mythology.